Transportation is vital to the well-functioning of economic activities and a key to ensuring social well-being and cohesion of populations of any country. One cannot overemphasize the importance of transportation than call it the 'lifeline' of a nation. Adequate and sustainable infrastructure is a fundamental precondition for transport systems and it has been proven by so many instances how transport infrastructure has added speed and efficiency to a country's progress. However, in their endeavour to facilitate transport and develop a sustainable transport infrastructure, decision-makers in governments and international organizations face difficult challenges. These include the existence of physical barriers or hindrances, such as insufficient or inadequate transport infrastructures, bottlenecks and missing links, as well as lack of funds to remove them. Solving these problems is not an easy task. It requires action on the part of the governments concerned, actions that are coordinated with other governments at international level. This decision making needs inputs in the form of relevant data. Large data systems are capturing significant performance, operational and planning data in the transportation industry. These data can not only assist in decision making but also improves service evaluation, customer satisfaction, operational efficiency and overall system performance, leading to a sustainable transport infrastructure. At the core of most of this data are spatial elements that describe the location of relevant transport data like transit boarding, customer location, activity centres, assets and transit service. Geospatial technology provides a unique advantage of gathering, organizing, evaluating and communicating data; transforming data into information. GIS is a powerful, efficient tool to construct and analyze transportation networks; conduct impact assessments; and create visual representations of assets, project locations, and transportation data layers. 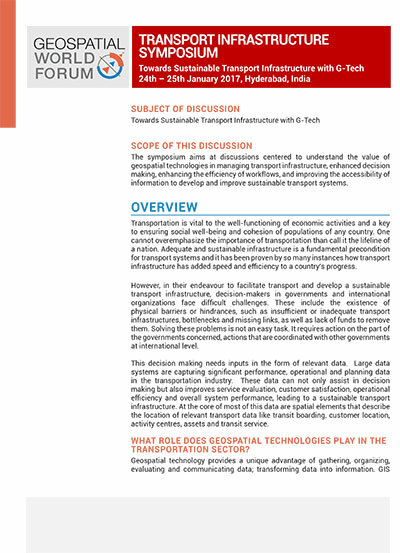 Understanding the value of geospatial technologies in managing transport infrastructure, enhanced decision making, enhancing the efficiency of workflows, and improving the accessibility of information, an exclusive two day symposium for transport infrastructure is being organized with the theme: "Towards Sustainable Transport Infrastructure with G-Tech" on 24th and 25th January as part of the Geospatial World Forum – 2017. This symposium will bring experts from around the world on how Geospatial technology is being used every day to develop sustainable transport infrastructure & improve transport systems. It will also discuss the prospects and applicability of the Geospatial technology in various phases of developing transport infrastructure. The symposium will provide a breadth of Geospatial experiences to showcase how agencies of all sizes and budgets are utilising this technology and improving transportation service and ultimately developing a sustainable transportation infrastructure. The aim of the symposium is to advocate extensive use of geospatial technologies for sustainable transport infrastructure development. Geospatial technology has immense potential to be a decision support system across various stages and aspects of transportation infrastructure – from planning, building, maintenance, load management, navigation, automation, passenger information management, safety, vehicle tracking, and environmental concerns. This session will witness deliberations from policymakers and decision makers of the transportation industry across the globe regarding their vision on the numerous geospatial solutions and innovations for a sustainable transportation infrastructure development and management. Rail System is one of the major transport systems in the world. It includes railway line design, build, construction, monitoring, management and maintenance. The need is of a platform for analyzing rapid advancements, tools and technologies like remote sensing, GIS, GNSS/GPS and automated machine controls. This session will deliberate on these key strategies for modernization in Railways sector. The major focus of the session would be to understand the role and relevance of geospatial technologies in survey, planning, designing and constructing the new routes and also in monitoring and managing the existing routes. The eminent speakers like surveyors, planners, designers, constructors will bring forward the framework to maximize the uptake of the technology in the railway infrastructure project life cycle. The themes for the session would focus on the application of Geospatial technologies in the four major phases of the railway project – survey and mapping, plan and design, construction, operations, maintence and safety. Digital Railway is the representation of the railway system that is spatially referenced and interconnected with the world's digital network. It incorporates the use of vast amount of geo-referenced information to present rail network in three-dimensional description of multi-resolution, multi-scale, multi-dimensional. The session will focus on developing new railway information systems, digitization of the railway infrastructure (lines, bridges and tunnels, stations, signal system, etc.) and railway environment (dynamic and static information, multi-resolution and 3D information) based on geographical information system (GIS), Global position system (GPS), Remote system (RS), information system. Roads are main arteries of modern society's infrastructure, contributing heavily to the distribution of goods and persons. Road agencies face an enormous challenge in keeping their infrastructure operating smoothly and efficiently. The Geospatial technologies play a major role in surveying, planning, designing, navigation, routing, traffic control and evaluation of the road network. GIS technology is combined with 3D and wireless communication technologies, GPS, to manage highway maintenance data. This session will present the overall context within which various activities are carried out and will try to build an understanding of transport infrastructure projects particularly in roadways and highways. It will bring forth the major role of geospatial technologies in management of these activities, major challenges and the possible solutions. The stakeholders of the community would focus on the application of Geospatial technologies at every level in the road and highways transportation project– surveying, mapping, planning, designing, construction, navigation, routing, traffic control, evaluation and maintenance. 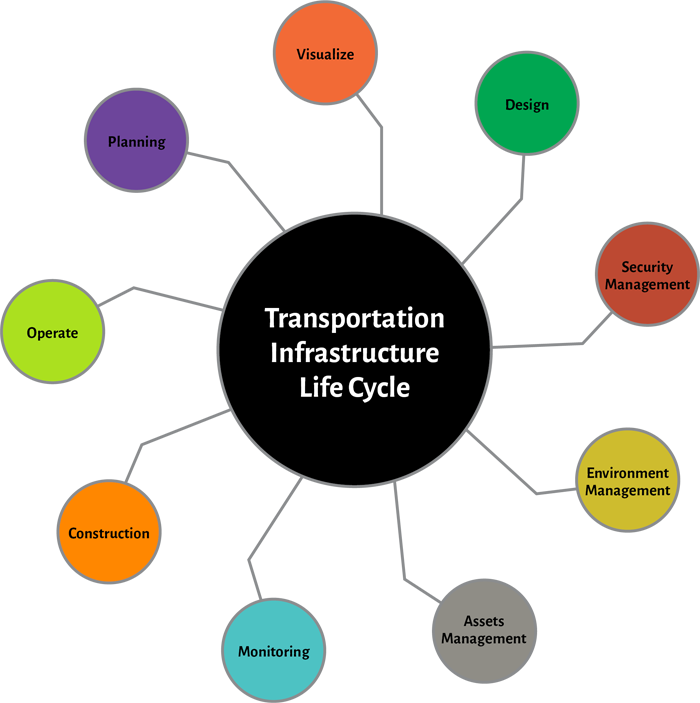 Ascertain the state of knowledge of G-Tech use in transport systems planning and management. Find out about the latest developments in models, programs, tools and techniques. Inform yourself about the use of G-Tech in sustainable transport infrastructure development across the globe and exchange information and experience on this.